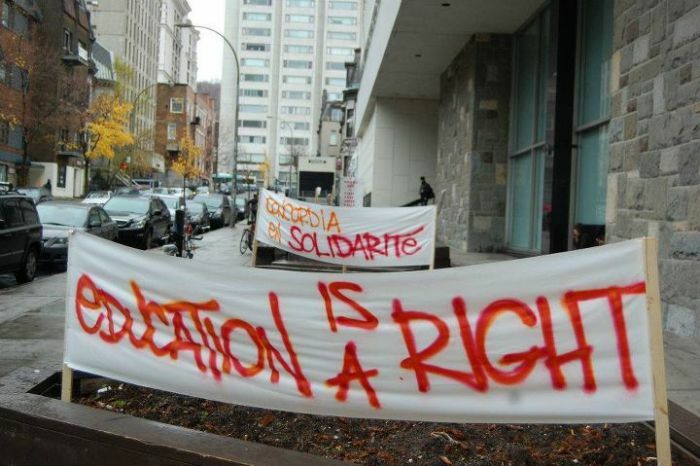 On May 19, 2012, Quebec’s Liberal government passed draconian legislation, Law 78, to smash the mass student strike which has shaken Quebec society over the past 4 months. The so-called Loi de Matraque (truncheon law) is an attack on the rights of association, demonstration and free speech. It suspends academic sessions at all Quebec colleges and universities affected by the strike, prohibits picket lines at educational institutions, forces professors (who had largely been supportive of the strike) to report to work when classes resume in August, authorizes withholding of dues check–offs for any student association deemed responsible for disruption of courses, and outlaws any demonstration that is not pre-approved by the police. Student associations found in violation of the law’s provisions will be punished by fines of up to $125,000 per day. On May 22, 200,000 people took to the streets to oppose this repressive law and support a negotiated settlement. Later the same day, the first “concert des casseroles” to show popular displeasure with the law was organized by inter net ‘word of mouth’. The banging of pots and pans, borrowed from the Argentinian masses, has turned into a regular evening occurrence in many Montreal neighbourhoods. The police have chosen to use their new powers selectively and are biding their time. Even so, there have been more than two thousand arrests since the conflict started (four times the number arrested during the invocation of the War Measures Act in October 1970). Several students have been seriously injured by police weapons. Certainly, the huge demonstrations of March 22, April 22, and May 22 were virtually free of incidents as both police and provocateurs bowed to the law of massive numbers. The students have won widespread admiration for their courage, tenacity and creativity. Yet the government remains intransigent. Why? Of course, there has been the inevitable backlash. Thirty years of “retro-liberalism” have had an impact on popular consciousness. Many believe the students should “pay their share” since austerity appears inevitable. Many want to see order restored. The corporate media of course actively promote this view and try to taint the students by playing up every violent incident (though not, of course, the violence of the police). Remarkable in this respect is the difference in tone of the French versus the English speaking media. The most vitriolic hostility to the students comes from the right wing media outside Quebec; and inside Quebec, attitudes are highly correlated with mother tongue. But this alone does not explain the government’s tough no-concessions stance. The Liberals are very much the party of the Quebec capitalist class and Charest their lieutenant. The Quebec bourgeoisie is anxious to impose austerity in a vain attempt to improve the competitive position of Quebec capital. The Liberal years in office have been dedicated to rolling back the legacy of the so-called ‘Quiet Revolution’, that is, the gains that the labour upsurge of the 1960’s and 70’s secured for Quebec workers and the Quebec nation as a whole. Indeed, the government was able to wring major concessions from the Quebec public sector unions in 2005 and 2010. By contrast, in 2005, the Liberals were forced to retreat before the student mobilizations that greeted their first attempt to force through a tuition hike. This time they are determined to win. In order to prevail against such a determined opponent , the students would need the support of the labour movement, and not just the resources which the unions have donated, but the preparation and organization of at least a one-day general strike. This the union leaders have refused to contemplate. Unfortunately, although the idea of a ‘social strike’ is in the air, no significant political force has been prepared to take this demand into the unions and fight for it. Whatever the outcome of the strike, Quebec’s young students have shaken the neo-liberal status quo to its roots. The fight for a freeze on tuition fees linked to the goal of achieving free higher education has struck a nerve. Two different visions of society are posed: on the one hand, relentless commodification of both natural and human resources to benefit the few, drive down the living standards of the many while degrading the environment; and on the other, collective democratic control over the commonwealth so as to provide a decent life for all, and promote the stewardship, rather than the ruin, of the planet. Previous PostCharge, Try, Jail Criminal Cops of the Toronto G20 SummitNext PostSpread the Quebec Strike! Solidarity with the Students!